Please go here to see over eighty people that Madonna has copy pasted /plagiarised with more to be added soon. Updating this blog is boring for me but eventually I'll have the Listal list transferred here. My main blog with profiles of artists who are ORIGINAL is HERE. 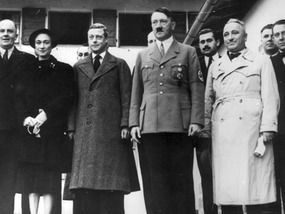 "But Madonna's movie is silent on whether Wallis and Edward were Nazi sympathizers, despite the historical record plus the FBI reports and film of the couple meeting Hitler in 1937, shaking hands while wearing sunny smiles. "Libel," Madonna says in interview after interview"